EPIC FAIL: Boozy Bread Pudding! Anyone who bakes a lot has their fair share of failed baking projects…and I am no different. Even when I have trouble, you usually see my finished products: pretty cakes and cute cupcakes. Well, it’s not all pretty cakes and cute cupcakes. I figured since July is a slow month for baked goods, I would share my most recent epic fail, a bread pudding that I made for Mother’s Day. We celebrated Mother’s Day with my in-laws this year, and my Mother-in-law loves bread pudding. So does my dad, but I’m actually glad he was not present for this cluster f**k. Why make more people suffer than absolutely necessary? So what was so bad about this bread pudding? First off, the recipe called for soaking raisins in 1/4 cup of bourbon overnight. I thought, “Great! 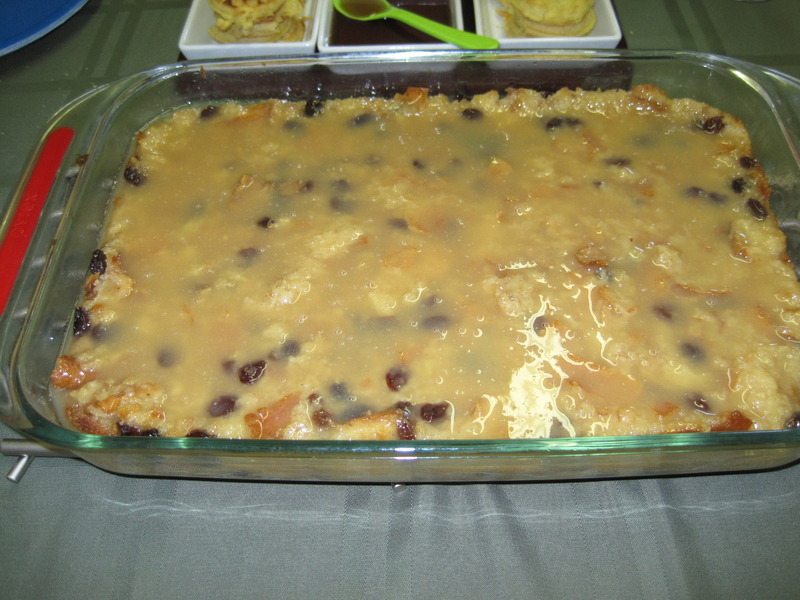 This will really make the bread pudding stand out and give it a kick.” Well, every bite released a kick of straight bourbon into your mouth, and with multiple raisins in every bite, it was as my brother-in-law called it, “edible booze”. But to add insult to injury, the sauce called for 1 CUP of bourbon. I decided to cut that down. I can’t remember if I used 1/2 or 1/4 cup, but whatever I used was way too much. Because the raisins were saturated with bourbon, the sauce kind of stayed on top, and didn’t really absorb into the pudding. This was good, because you could tell that the actual pudding was delicious. But between the soaked raisins and the boozy sauce, it was rendered inedible. We actually threw it out, and I hate to do that. I’m not even going to post the recipe until I can find a better sauce and try it again with regular raisins. But once I do, I will do a new post because bread pudding is a great brunch dish. So there you have it, proof that not all recipes are created equal, and sometimes you mess up even when you try to account for this. So, what was your most memorable baking failure? Please share stories!! One Response to EPIC FAIL: Boozy Bread Pudding!